A free walking tour of the Union Square neighborhood is available each Saturday (except holidays), year-round. The tours start at 2:00 p.m. and lasts an hour and a half. On the tour, you’ll learn about the social and political history of the Union Square neighborhood and the people, events, and architecture that have influenced the community. The tour is presented by the Union Square Partnership in cooperation with Big Onion Tours. Union Square is located where Broadway and 4th Avenues converge at 14th Street. 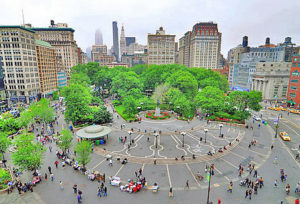 Union Square Park is a busy public space where you’ll find a collection of statues, a green market (Mondays, Wednesday, Fridays, and Saturdays), busking musicians and performers, street vendors, chess players, and lots of visitors and residents enjoying the park. The surrounding area includes bookstores (The Strand and Barnes and Noble), shops, restaurants, live music venues (Webster Hall, Irving Plaza), and more. The tour takes place each Saturday (except holidays) Start time is 2:00 p.m. and tours last an hour and a half. Meet at the Lincoln Statue located on the 16th Street traverse through Union Square. Look for a guide holding a “Union Square: Crossroads of New York sign”. The tour is free and no reservations are required. Visit the Union Square Partnership website for details.